The 21st century evangelist is one who can use technology and master the art of spreading ideas. One who learns how to share the good news through social media tools and entertainment. I advise every evangelist I know to study marketing trends among business and organizations outside of the Church. Here is one of my favorite guys. His name is Seth Godin. Evangelist guru, in this entertaining video he reveals the shifts occurring in the hearts of people today and how we are to win them. Enjoy! His premise in one word is be… REMARKABLE! 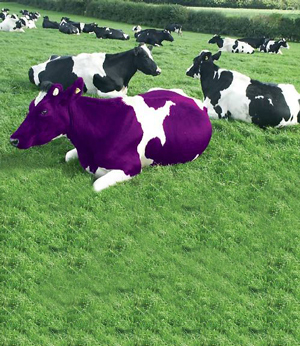 A purple cow is remarkable. Don’t be an everyday cow!